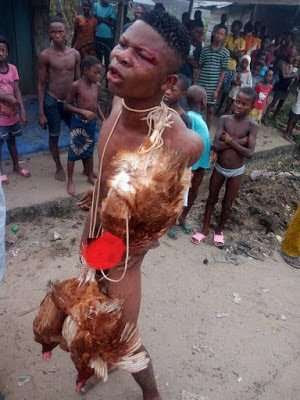 A mob in Ikorodu paraded the teenager naked and tied a flock of chickens around his neck. A teenager suspected to have stolen some chickens has been paraded naked in public while a mob gave him the jungle justice. This happened in the Ikorodu area of Lagos state, where a flock of the birds were tied around his neck like a noose. The boy, whose name has not been disclosed had a blood stained eye brow which he sustained from the beating he received from the mob.